FIANNA FÁIL’S NIALL Collins has said any concerns about the Israeli embassy in Ireland shutting down over the Occupied Territories Bill is an “overreaction”. The Foreign Affairs and Trade spokesperson was at pains to repeat that the Bill, which is before the Dáil this afternoon, does not solely target Israeli goods. He said the enactment of the legislation would prohibit the purchase of goods or services produced in all settlements deemed illegal. 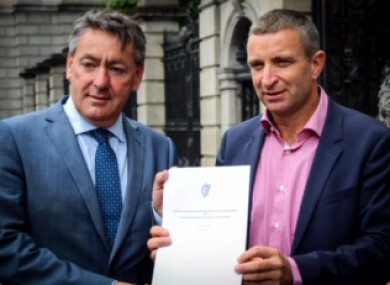 The Bill, which was produced in the Seanad by Senator Frances Black, “is an important tool in demonstrating that Ireland is opposed to illegal occupations wherever they occur” said Collins. Following reports that the Irish embassy may close if some members of government vote in favour of the Bill, Collins said he “hoped it wouldn’t come to that”. The Bill, which has cross-party support, is being opposed by Fine Gael. Tánaiste Simon Coveney told TheJournal.ie before Christmas that the advice government has received from the Attorney General is the legislation is “not legally sound” and urged Fianna Fáil to drop its support for the Bill. Separately, Fine Gael faces another problem due to the Independent Alliance (IA) members of government calling for a free vote on the issue. Shane Ross, Finian McGrath and John Halligan have been vocal about their support for the Bill over the recent months. McGrath told TheJournal.ie last year that talks had been held with Coveney about a free vote. At yesterday’s Cabinet, it is understood that the Independent Alliance members around the table had a “tough battle” with their government colleagues over the matter. Concerns of the possible closure of the Israeli embassy due to members of government voting in favour of the Bill are believed to have been raised. While IA members were seeking a free vote, it is understood McGrath, Ross and Halligan will abstain from the vote tomorrow. Niall Collins has appealed to Fine Gael to “show some courage, stand on the right side of history, and support it”. Writing an opinion piece for this website, the new Israeli ambassador to Ireland, Ophir Kariv, called on the government to reject the Bill stating that it is a boycott on Israeli goods produced in the West Bank. However, Collins noted that human rights charities such as Trocaire supports the Bill, adding that passing of this Bill would send a “powerful moral statement rather than an economic one”. He said something was similar was achieved by those that protested against goods from South Africa during apartheid in the 1980s. Collins estimated the value of trade between the two regions is between €500,000 and €1.2 million. “Ireland has a long history of standing up for international law and Fianna Fáil is proud to bring this bill to the floor of the Dáil. “Supporting this piece of legislation required careful consideration by my party, including time spent in the Middle East by my colleague Billy Kelleher TD and I. Our bill won’t end illegal settlements but it will demonstrate Ireland’s significant opposition to them and will send a message to countries continuing to flout international law,” said Collins. He added that the Bill has been “inaccurately and unfairly portrayed in some quarters as an encouragement to boycott the state of Israel. It is not”. However, he added that as a member of the international community, Israel has a moral obligation to adhere to international law. Speaking in the Dáil this afternoon, Collins said “if now is not the time to act, then when?”. The Bill has sparked some international controversy, with the Jerusalem Post reporting protests over the proposed law and the Boston Herald stating that a number of Boston power brokers have written to Irish politicians. Email “Concerns over Israeli embassy closing down over Occupied Territories Bill 'an overreaction' say FF”. Feedback on “Concerns over Israeli embassy closing down over Occupied Territories Bill 'an overreaction' say FF”.